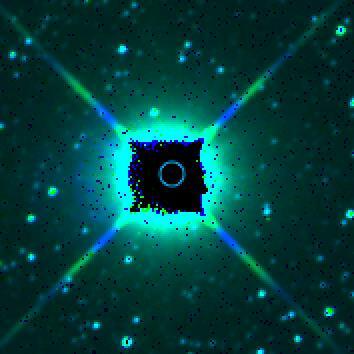 Extreme TNOs: Very distant solar system objects may have been found. Have Astronomers Detected the Most Distant Objects in Our Solar System? Maybe, but Probably Not. 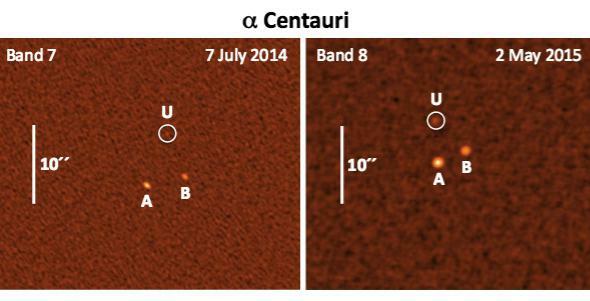 Observations of the binary star Alpha Centauri (labeled A and B) show a third object (U) apparently moving across the field of view over the course of a year. What is it? Photo by Liseau, et al, from the paper. Two astronomical research papers have just been submitted to the journal Astronomy & Astrophysics, and both make startling claims: The two teams claim they may have each separately found two very distant solar system objects, possibly far more distant than anything previously seen. OK, hang tight a sec. I know a lot of media will jump on this with headlines like “NINTH (OR MAYBE) TENTH PLANET FOUND!” and the Nibiru crowd will go apoplectic. But don’t fire up the warp drive just yet folks. There are many reasons to be very skeptical here. First, the papers are not yet peer-reviewed; they’ve been submitted to a journal, but not vetted. So there may be errors in them. Also, both are based on limited observations (two detections each) over a short time range. And third, the sheer unlikeness of them finding a planet given the small field of view they used makes me very skeptical indeed. So while interesting, it’s not at all clear that these objects are even real, let alone distant planets. So what’s what? Let’s see. Both teams used observations from the Atacama Large Millimeter/submillimeter Array (or ALMA). One team was observing the nearby star Alpha Centauri (or Alpha Cen for short), and the other team the more distant W Aquilae (or W Aql). The latter observation is easier to explain, so I’ll start there. They observed W Aql in March and again in April 2014. They saw a source in the first observation that appeared to move by the time of the second. A third observation was made in May 2014, but nothing was seen. 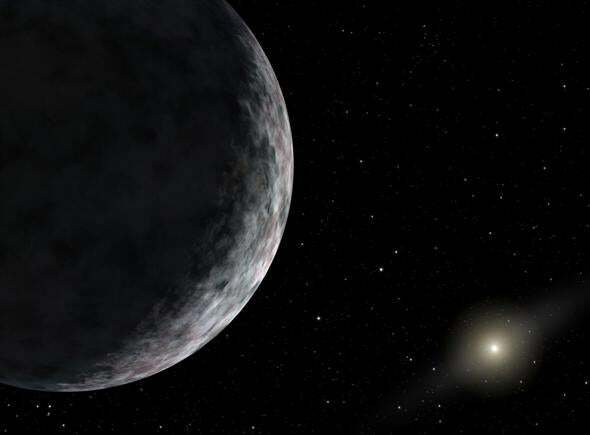 Given how much it appeared to move, and how bright it is, they conclude it is consistent with an object in the solar system, no farther than about 600 billion kilometers from the Sun. If it’s far away it could be a planet-sized object, but if it’s closer it would have to be smaller. It could be one of the smaller icy worlds well outside Neptune’s orbit; it’s suspected million may exist with diameters of a few hundred or thousand km. Heck, Pluto and Eris are (large) examples of them, and different populations of them may extend past Neptune for hundreds of billions of km. So it’s not too weird to wonder if this were one of those (and to be honest, if this is real, I’d bet this is what it is). Or it might not exist at all. Bear that in mind. There may be a lot of smaller, icy objects far out past Neptune. We’ve only found a handful so far. The second team were looking for planets around the two stars that make up the binary system of Alpha Centauri, the nearest star system in space to the Sun. One planet was claimed to have been found in 2012, but since then has fallen into controversy. Another group looked at the data and said the planet was a spurious result; in other words, not real. They observed Alpha Centauri twice; once in July 2014 and again in May 2015. Like the first team, they too saw a moving source (see the picture at the top of the post). And, to their surprise, it moved along more or less with the stars! The reason that’s important is that Alpha Cen is so close to us that its actual physical motion through space can be detected. Over time, it moves relative to other stars, which astronomers call proper motion. A planet orbiting one of those two stars should therefore be seen to move with them. If it doesn’t, it’s a background source, another star or maybe a distant galaxy. However, there’s a problem. The object detected is far too bright to be a planet at the distance of Alpha Cen. If it were a star, though, it would’ve been detected long ago. Given how bright it is, it must be a smaller object much closer to us than Alpha Cen, and only coincidentally aligned with it in the sky. Going through the math, the authors estimate it could be a cool brown dwarf three trillion km away, or a super-Earth 45 billion km out, or a smaller icy chunk as much as 15 billion km from the Sun. If this object is real, then, as before, one of those icy bodies out past Neptune isn’t too big a stretch. But a super-Earth or brown dwarf? These are far less likely. Super-Earths are planets more massive than Earth but lower mass than Neptune’s. We’ve detected quite a few of these orbiting other stars, so we know they exist. Brown dwarfs are objects more massive than planets but less than stars. We know of hundreds of these objects as well. However, it’s pretty unlikely the teams would have spotted such an object. Why? Statistics. So. Real? Unreal? What Are the Odds? Why would I think an icy body is possible when a planet or brown dwarf isn’t? It’s because there are lots of iceballs out past Neptune, millions. But it’s very unlikely there are more than a few bigger objects out there; the bigger they are the fewer there’ll be. And that’s the problem. As my friend and astronomer Mike Brown points out, the issue is statistics. ALMA has a teeny tiny field of view; it can only look at a very small area of the sky at a time. Imagine trying to look for your keys that you dropped on a football field, and you had to look through a soda straw to find them. If you looked just once, it would be a fantastic coincidence if you found them in that one shot. Or think of it this way: If they did find a planet looking at such a small piece of sky, it would imply that it’s likely the sky is full of such objects! That removes the coincidence; there are so many you were bound to find one. But if true, that would mean there are hundreds of thousands of such objects in the solar system. More! That makes a planet-sized object pretty unlikely, to say the least. I might believe that it could be one of many smaller (several hundred km in diameter) chunks of ice way past Neptune because those are common. But even then it’s still unlikely given these circumstances. Alpha Centauri, observed by WISE. As you can see, anything nearby is wiped out by the stars’ glare. The infrared observatory WISE might have a shot at it, and has been used to look for such beasts; it found that no Jupiter-sized planet could be any closer than three trillion km, and a Saturn-sized one 1.5 trillion. A super-Earth would be fainter, and could be closer and still remain unseen, and of course smaller icy worlds even closer (though so close to Alpha Cen or W Aql in the sk to be difficult to spot in that case). Some people have claimed finding some evidence for one such planet in our solar system, but that remains very tentative and circumstantial. So there you go. I am highly skeptical, but interested, and for me to be swayed further at least two things need to happen: a) both papers get peer reviewed and accepted into the journal, and 2) the astronomers get more time on ALMA to observe these objects. Even then, we need to be sure to be skeptical. This is something of an extraordinary claim, so I’ll need something of extraordinary evidence. Certainly more than we have here. Tip o’ the lens cap to Johanna Teske, Lee Billings, and Mike Brown.